Now is the peak season for seeing the Northern Lights AKA Aurora. You have to make sure you go pretty far North though. North Sweden, Iceland, Greenland, Finland, North Norway are all prime places. Below we are showing a 25 second video from Norway. 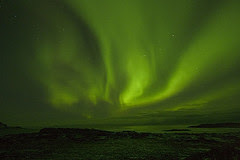 The Latin word for northern lights is Aurora Borealis, was first used early in the 17th Century. Aurora was the goddess of dawn, i.e. red light of dawn, in ancient Roman mythology and Borealis means northerly. A translation from Latin is something like northerly light of dawn. 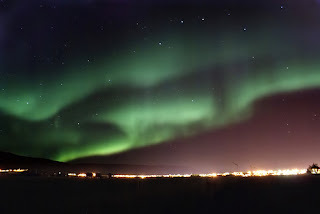 If you fancy a hunt for the Northern Lights you could try flights to Reykjavik with Iceland Express and then this Northern Lights tour booked through Isango which is simply a three hour trip taking you from your hotel in Reykjavik to the most likely places to view the Northern Lights on the night. This video is from a Norwegian TV show and tells how the Danish language is in a bad way! Most people say that of the Scandinavian languages, Norwegian is the easiest and Danish is the hardest. An interesting article just popped up on the Time travel section - Copenhagen for February half term. The author, Janice Turner, writes about a family holiday in Copenhagen which they chose because it's a cyclists city. The same article led us to another article which looks at 4 "proper" winter cities and it is good to see they have chosen Stockholm along with Vilnius, Boston and St Petersburg. Stockholm is also subject to an article on the Wales on Sunday website, where the author, Hannah Davies writes about clean streets and points out that Sweden is not as expensive as people think. Have a look at this comparison of a British nightclub Vs. a Swedish nightclub. It's been doing the rounds for a while now and features quite extreme examples but does make a good point. Nice article in a major UK newspaper about a family holiday to a lake house in Sweden. The author, Stephen Bleach, takes his family to a remote farmstead where they make their own entertainment as they get back to nature. Kenneth Brannagh is coming to Southern Sweden. The award winning actor is gearing up to play fictional Swedish detective Kurt Wallander on films made for the BBC 1. Three ninety minute films based on Henning Mankell's bestselling crime novels will be made in 2008. All three films will be shot in Ystad a small 13th century port in the south of Sweden. According to Mankell's production company Yellow Bird, the Academy Award-nominated actor got in touch with them last year requesting to play the title role. The Observer ran an article on the prospect of the Wallander books being made into English films 18months ago. Branagh said: "Wallander is a wonderfully complex and compelling character and I am excited to be playing this fascinatingly flawed but deeply human detective,"
Mankell's books have sold more than 25 million copies worldwide, giving the dramas big global potential. The novels which will be adapted include Sidetracked , Firewall , and One Step Behind . Production is set to start this spring and will go throughout the summer. It's been seven years since the Moose was mooted but local officials have now given permission for construction of the worlds largest Elk. Before you get too excited, here is some bad news : you won't be able to sleep in the Elk - it won't contain any overnight accommodation. 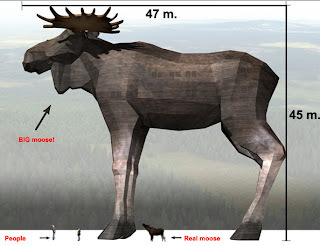 To be ready in 2009, the Giant Moose will be situated in Northern Sweden. To enter the moose you'll either ride along the road that will be built all the way to the top, or use the wood-paths alongside the mountain. On the top you'll enter the pine tree in which the elevator will lift you 35 m to the mouth. Inside the moose there will be 3 floors with a surface of 500 m², the content of these floors will be conference-rooms / exhibitions / concert-hall etc. 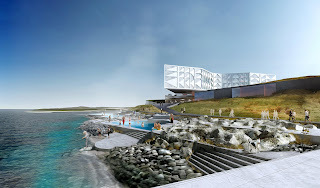 The neck will contain the kitchen and the restaurant with a surface of 250 m². The outdoor café will be on top of the antlers and will have a surface of 100 m². Parts of the branches on the big pine tree will serve as a big umbrella, protecting the outdoor café from rain and snow. All kinds of accommodation will be in nearby cabins, hotels and such. in 2008 the main event there is the European Masters Games which starts at the end of August. The kalldbadhus (Cold bath house) is a wonderful, bracing and healthy way to get into Scandinavian lifetstyle. For the less adventurous they often feature cosy cafes. Quite simply you swim in the sea, whatever the weather, (even if you have to break the ice!) then warm up in the sauna afterwards. It has been described as a workout without the work because of the endorphins that are released. The Swedes refer to the experience as a full body massage. Stockholm has a beautiful looking new cold bath house on the way. It's in a central area and looks to have a stunning design. Malmö has a kalldbadhus dating from 1898 which features a wood fired sauna and panoramic windows over the oresund sea and to the turning torso. On the other side of the Oresund sea is Kastrup bath house.